"Bold flavors in a very light sauce: substantial and satisfying, good warm-weather alternative to spaghetti bolognese. You might think the sauce too thin the first time you make it (almost a thick broth), but it will be full of flavor. Quantities of tuna, sun-dried tomato, and artichoke are variable to preference, just be sure to provide an overall robust combination, always mindful of potential saltiness (esp. regarding the sun-dried tomatoes). Also, fresh oregano or lemon thyme could be substituted for thyme. This should go without saying: please don't put any cheese on this pasta." Heat 2 tablespoons olive oil in a large saucepan over medium-high heat, and cook the onion 4 minutes, until tender. Mix in the thyme, and continue cooking 2 minutes, until onion is golden brown. Set aside onion and thyme. Place the tuna in the saucepan, and cook 2 to 3 minutes, until browned. Set aside, and keep warm. Heat the remaining oil in the saucepan. Return the onion and thyme to saucepan, and stir in the white wine. Cook until reduced by about 1 tablespoon. Mix in the chicken stock, lemon juice, and lemon zest. Reduce heat to medium, and continue cooking 10 minutes, until reduced to about 3/4 cup. Mix the sun-dried tomatoes and artichoke hearts into the saucepan, and cook just until heated through. Return tuna to the saucepan, and cook to desired doneness. Toss the cooked pasta into the saucepan. Season with salt and pepper. We loved this! The only change I made was to grill the tuna on my indoor grill and add 2-3 T. butter to the sauce at the end just to give it a bit of richness. We'll have this often I'm sure. I admit it, I usually leave out the tuna and just enjoy the pasta. It's fantastic! Delicious! That's all I can say for this recipe. My husband and I love spicy food so we sprinkled some chilli flakes on it and it was even more delicious. 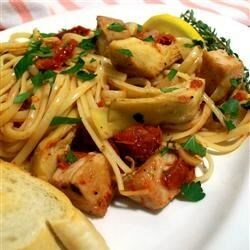 I really liked the flavor of this dish but next time I'll decrease the amount of pasta or increase the artichoke and sun dried tomatoes. We'll be making this again. Very unique flavors in this dish! Make sure to not over cook the tuna..